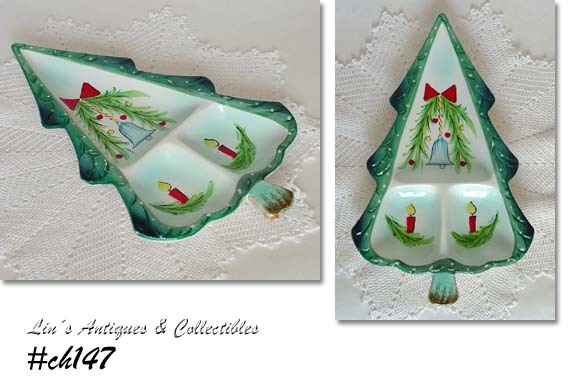 THIS LISTING HAS THE LARGER SIZE CHRISTMAS TREE SHAPED TRAY MADE BY HOLT HOWARD! TRAY MEASURES 13 ¾”, BACK HAS COPYRIGHT DATE OF 1959, HOLT HOWARD, HAS THE ORIGINAL HOLT HOWARD STICKER/LABEL, AND IS IN THE ORIGINAL BOX! TRAY IS IN WONDERFUL CONDITION WITH A COUPLE TEENY FLAKES OF MISSING COLOR (ONE ON TREE “TRUNK” AND ONE ON EDGE – NEITHER ARE DETRIMENTAL). NICE ITEM, NICELY PRICED! WOW – WHAT A FIND! 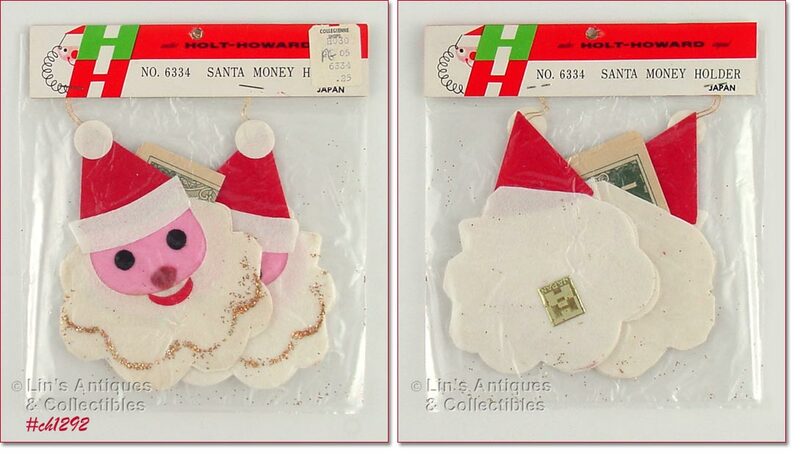 THERE ARE 2 SANTA MONEY HOLDERS MADE BY HOLT HOWARD AND THEY’RE STILL IN THE ORIGINAL PACKAGE! THIS HOLT HOWARD ITEM IS NOT PERFECT BUT IT IS SUCH A DIFFICULT TO FIND PIECE THAT I COULDN’T RESIST PURCHASING IT! THE “SNOWBALL” CANDLE HAS A LENOX STICKER/LABEL ON BOTTOM. SANTA IS NOT MARKED BUT IS SHOWN IN CHRISTMAS COLLECTIBLES REFERENCE BOOKS. THE IMPERFECTION ON SANTA IS A CLEAN BREAK ACROSS THE BASE – IT HAS BEEN RE-GLUED (SEE PHOTOS). NICE ADDITION TO A COLLECTION! THIS LISTING HAS TWO HOLT HOWARD ERMINE ANGEL CANDLEHOLDERS – PRODUCED IN 1958! THEY ARE IN EXCELLENT CONDITION AND STILL RETAIN THE RED AND GOLD HOLT HOWARD STICKERS. THIS IS INDEED A FIND – A SET OF 6 HONEYCOMB ORNAMENTS BY HOLT HOWARD STILL IN THE ORIGINAL BOX! PER BOX, THESE ARE “NO. 6527, HONEYCOMB BAUBLES, 6 PIECES, MADE IN JAPAN”. THERE ARE 2 WHITE COLOR ORNAMENTS, 2 RED, AND 2 GREEN AND EACH IS DECORATED WITH GLASS BEADS. I DON’T BELIEVE THESE ORNAMENTS HAVE EVER BEEN USED – EACH RETAINS THE RED AND GOLD HH FOIL LABEL ON THE HANG CORDS! THE BOX HAS BRIGHT COLORS AND ONLY DAMAGE IS A SMALL PIECE OF MISSING CELLOPHANE ON THE LID – THAT’S IT!! THIS IS THE DIFFICULT TO FIND HOLT HOWARD COOKIE JAR FROM 1960! THE LID HAS SOME MISSING COLOR, MOSTLY ON UNDERNEATH EDGE. THE SANTA AND METAL HOLDER ARE IN SUPER CONDITION. THE COLD PAINT ON THE JAR BOTTOM IS EXCELLENT BUT THE JAR HAS BEEN BUMPED CAUSING A BREAK/CRACK THAT EXTENDS DIAGONALLY ALMOST ACROSS THE JAR BOTTOM. PLEASE NOTE THAT THE COOKIE JAR BOTTOM IS NOT PERFECT BUT DISPLAYS WELL AND THE JAR AS A WHOLE IS AN EXCELLENT COLLECTIBLE AND COLLECTOR ITEM. HOWEVER, IF YOU DO NOT WISH TO HAVE THE BOTTOM INCLUDED IN YOUR PURCHASE, IT WILL REDUCE SHIPPING COST BUT NOT THE COST OF THE ITEM BECAUSE PRICING OF THIS ITEM IS BASED ON THE LID AND THE SANTA INSERT. 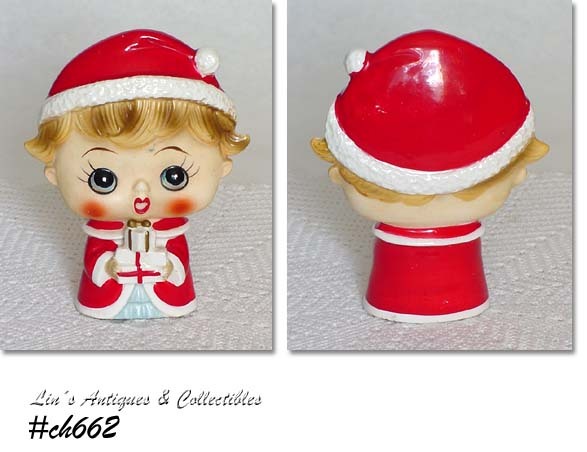 AS COLLECTORS KNOW, THE SANTA IS SELDOM FOUND AND IS HIGHLY COLLECTIBLE/SOUGHT AFTER. 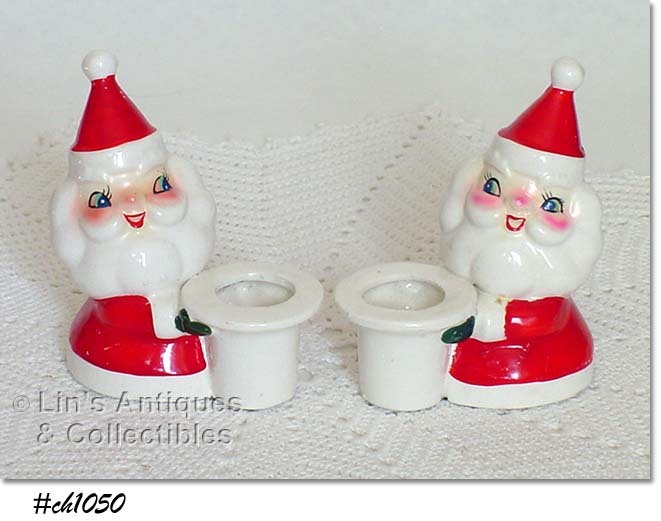 THIS LISTING HAS TWO COLORFUL, CUTE SANTA CANDLEHOLDERS! MEASURE 4” TALL (AT TALLEST) AND HAVE HOLT HOWARD FOIL STICKERS/LABELS ON BOTTOMS. BOTH ARE IN WONDERFUL CONDITION WITH A FEW FLECKS OF MISSING RED COLOR AND MINOR CRAZING. SUPER COLLECTIBLES! DIFFICULT TO FIND ORNAMENT! 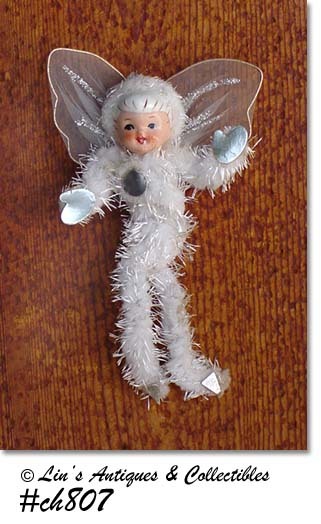 THIS IS A LOVELY SNOW ANGEL, MEASURES 6 ½” LONG (AT LONGEST), 3 ¾” WIDE (AT WINGS). IN VERY GOOD CONDITION – HAS A SLIGHTLY DISCOLORED AREA ON BACKS OF LEGS AND AT HER FEET. NEAT ITEM! 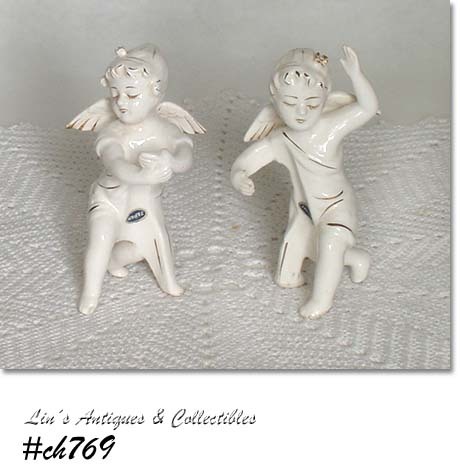 ADORABLE PAIR OF HOLT HOWARD ANGEL CANDLE HUGGERS! THEY’RE WHITE WITH GOLD COLOR ACCENTING, MEASURE APPROXIMATELY 4 ½” LONG (AT LONGEST), AND HAVE PAPER JAPAN STICKERS. EXCELLENT CONDITION! THIS HOLT HOWARD LISTING HAS A CHAMBER STICK STYLE WINKING SANTA CANDLEHOLDER (DATED 1958) AND A PRETTY ANGEL CANDLE HUGGER! WONDERFUL CONDITION. BEAUTIFUL COLOR AND EXCELLENT DETAIL ON THIS HOLT HOWARD SHAKER SET! 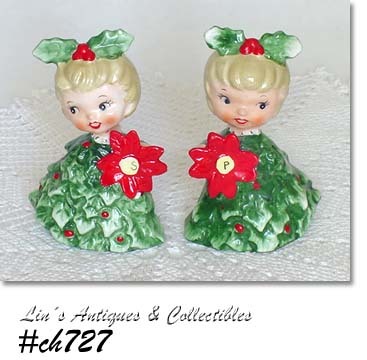 THESE ARE POINSETTIA GIRLS, MEASURE 4” TALL (AT TALLEST), HAVE HOLT HOWARD RED AND GOLD FOIL LABEL/STICKER, NUMBERED 6216, AND ARE IN EXCELLENT CONDITION. (THEY DO NOT HAVE STOPPERS.) GREAT COLLECTIBLES! THIS IS AN UNUSUAL AND DIFFERENT HOLT HOWARD CHRISTMAS ITEM! IT’S A GIRL HOLDING SOME PACKAGES AND THE UNUSUAL PART IS THE SIZE OF HER HEAD – IT’S LARGE AND OVERSIZED FOR HER BODY. SHE’S IN VERY GOOD CONDITION WITH A COUPLE FLECKS OF MISSING RED COLOR. APPARENTLY HAD TAPE ON BOTTOM TO PREVENT SCRATCHING FURNITURE AND THERE IS OLD GLUE RESIDUE – I DIDN’T SCRUB ON IT BECAUSE I DIDN’T WANT TO REMOVE THE REMNANTS OF THE BLACK AND GOLD HOLT HOWARD FOIL LABEL. CUTE ITEM! VERY PRETTY CANDLEHOLDERS PRODUCED BY HOLT HOWARD! MEASURE 3 5/8” DIAMETER, HOLDERS ARE WHITE WITH GOLD OUTLINES AND VEINS ON ALL LEAVES WITH RED “BERRIES” AT OPENING. SET IS IN EXCELLENT CONDITION WITH MINOR RED COLOR LOSS ON ONE HOLDER – NOT UNUSUAL BECAUSE THIS IS COLD PAINT. VERY NICE ITEMS, VERY COLLECTIBLE! PURCHASED AT AN ESTATE SALE, THIS LISTING HAS 3 SANTA ITEMS! 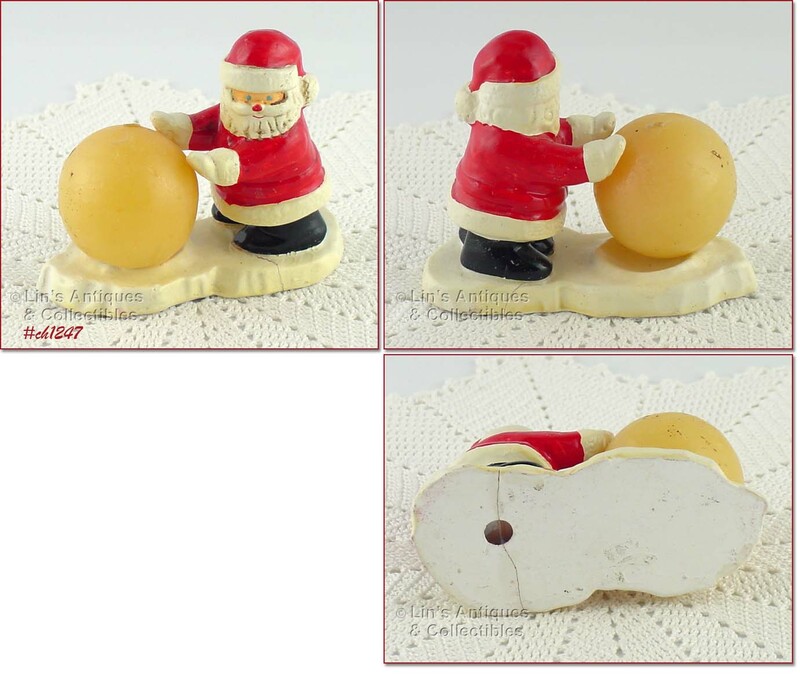 THERE IS A PAIR OF SANTA CANDLE HUGGERS MADE BY NAPCO AND DATED 1957. THEY ARE VERY COLORFUL AND ARE MINT CONDITION. THE OTHER SANTA PIECE IS A VOTIVE CANDLE HOLDER -- SANTA IS STANDING IN FRONT OF THE CYLINDRICAL SHAPE CANDLEHOLDER. VERY COLORFUL, SANTA HAS BLUE "RHINESTONE" EYES AND IS IN MINT CONDITION! HE MEASURES 4" TALL, THE COMPLETE PIECE IS 5 1/4" TALL (NOT COUNTING CANDLE) WHICH I BELIEVE IS THE ORIGINAL. THIS PIECE IS UNMARKED BUT HAS JAPAN PAPER LABEL THAT IS CONSISTENT WITH ONES USED ON SOME HOLT HOWARD PIECES. EXCELLENT HOLIDAY ITEMS -- ESPECIALLY FOR SANTA COLLECTORS! VERY PRETTY CANDLEHOLDER MADE BY HOLT HOWARD! 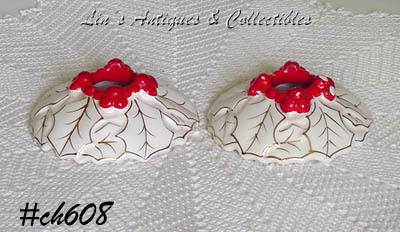 ROUND IN SHAPE, HAS POINSETTIA LEAVES THAT ARE WHITE WITH GOLD TRIM AND HAS RED BERRIES ALL AROUND OPENING FOR CANDLE. HOLDS A TAPER TYPE CANDLE, STILL HAS HOLT HOWARD PAPER LABEL ON BOTTOM. BEAUTIFUL ITEM THAT IS IN WONDERFUL CONDITION! 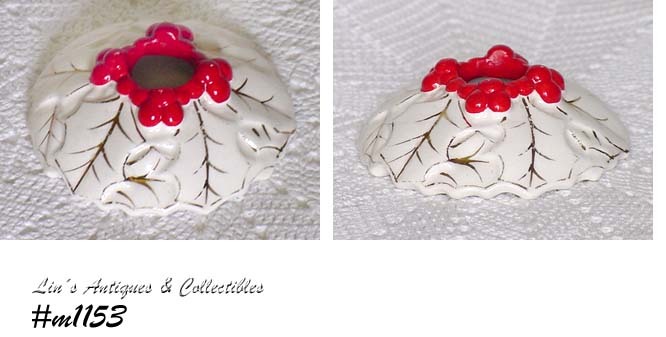 BEAUTIFUL TREE SHAPED CANDY DISH! 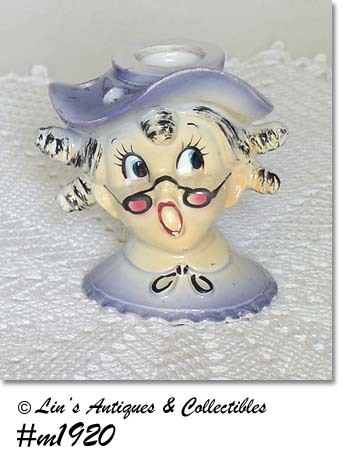 MEASURES 10" LONG (AT LONGEST), 6 1/4" WIDE (AT WIDEST), 1 1/4" TALL. "DECORATED" LIKE A TREE -- HAS ORNAMENTS (IN COLORS AND IN GOLD), OUTER EDGE HAS A GOLD COLOR SPONGE EFFECT, TREE "TRUNK" HAS GOLD TRIM, AND IT HAS AN ATTACHED GOLD COLOR STAR TREE TOPPER. NO LONGER HAS HOLT HOWARD PAPER LABEL, IT IS STAMPED IN RED ON BACK -- B078. 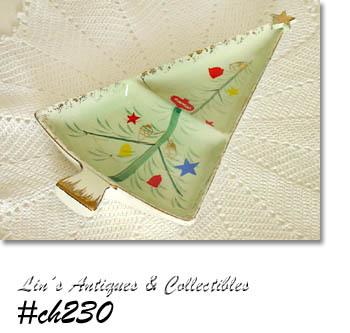 PRETTY ITEM THAT COMPLEMENTS THE LARGER TREE SHAPED TRAY/DISH WE HAVE LISTED. 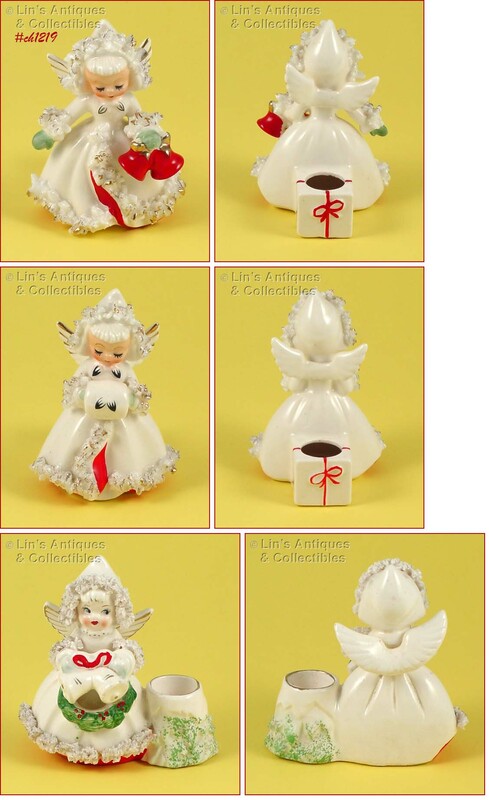 CHRISTMAS ITEMS PRODUCED BY HOLT HOWARD ARE SO PRETTY AND ARE VERY COLLECTIBLE! 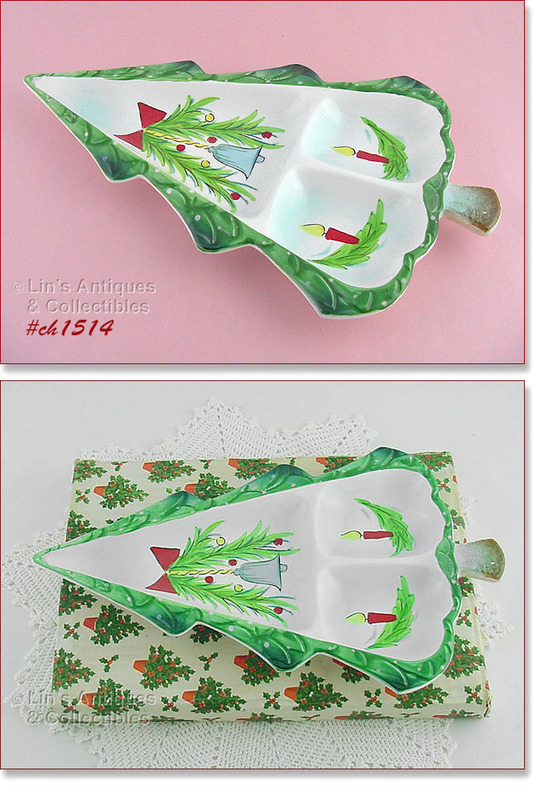 THIS IS A SNACK SERVER OR CANDY DISH THAT IS SHAPED LIKE A CHRISTMAS TREE. MEASURES 13 3/4" LONG (AT LONGEST) AND 8 1/4" WIDE (AT WIDEST). DISH IS DIVIDED INTO THREE SECTIONS AND HAS BEAUTIFUL COLORS AND DETAIL. TOP (LARGEST) SECTION SHOWS GREENERY, A RED BOW, AND A BELL. THE OTHER 2 SECTIONS SHOW A CANDLE IN SOME GREENERY. STAMPED ON BACK: 1959, HOLT HOWARD. STILL HAS ORIGINAL PAPER LABEL! IN EXCELLENT CONDITION -- NO CHIPS, NO CRACKS, NO CRAZING. IT HAS A FEW SMALL COLOR FLAKE OFFS ON THE TREE "BOUGHS" -- THAT'S IT AND THEY ARE NOT DETRIMENTAL. VERY PRETTY!